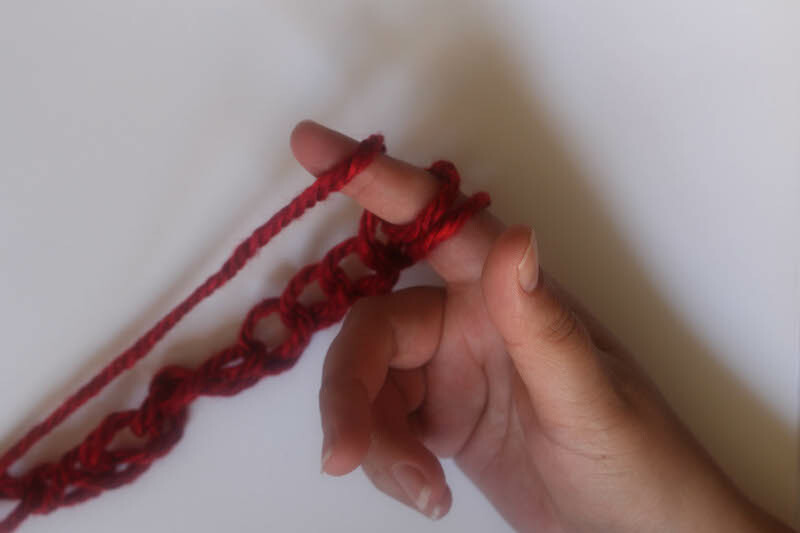 Finger crochet is a great way to enjoy crochet when you don’t have a hook on hand (or, when your hook isn’t the right size for your yarn). It’s also a great way to teach crochet, since your fingers only have to focus on the mechanics of the stitches and not on how to hold the hook. 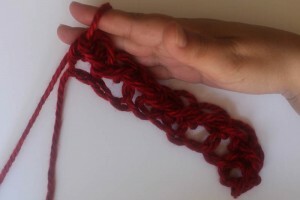 Since your fingers are probably relatively thick when compared to crochet hooks, start with bulky or super bulky yarns. 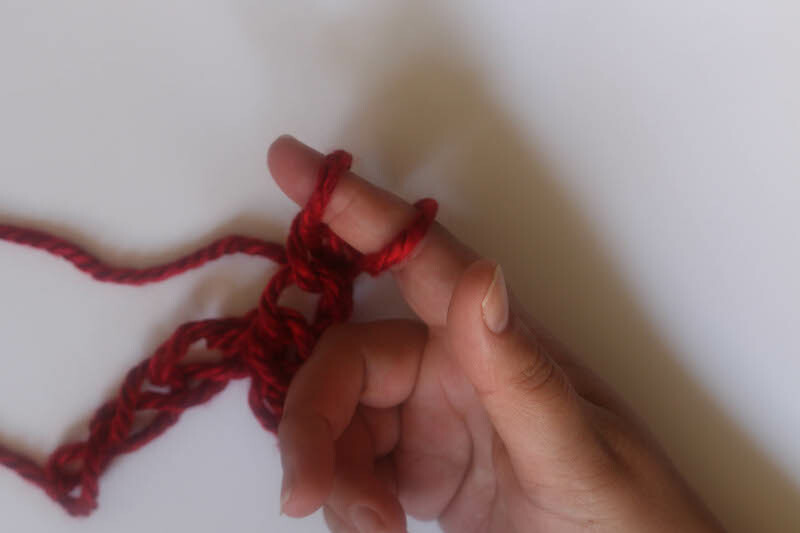 Once you have your yarn selected, start with a slip knot on the forefinger of your dominant hand (i.e., with your right hand if you’re a righty or your left hand if you’re a lefty). 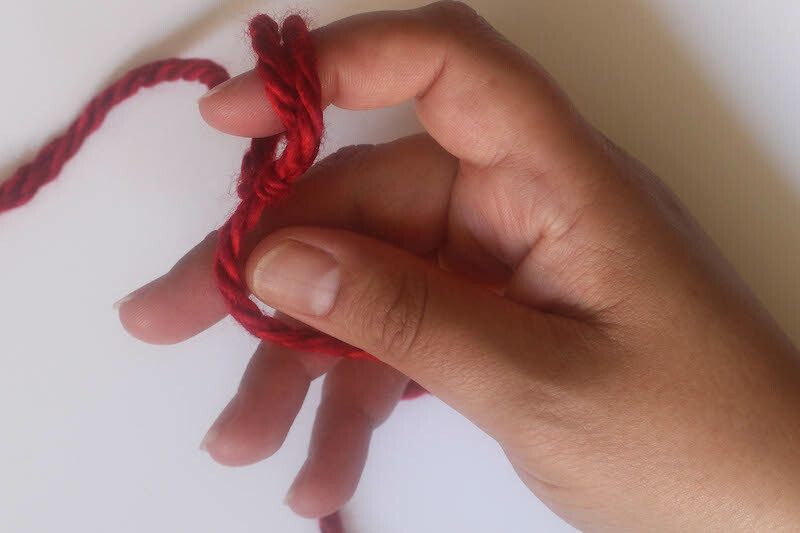 Leave the slip knot loose. 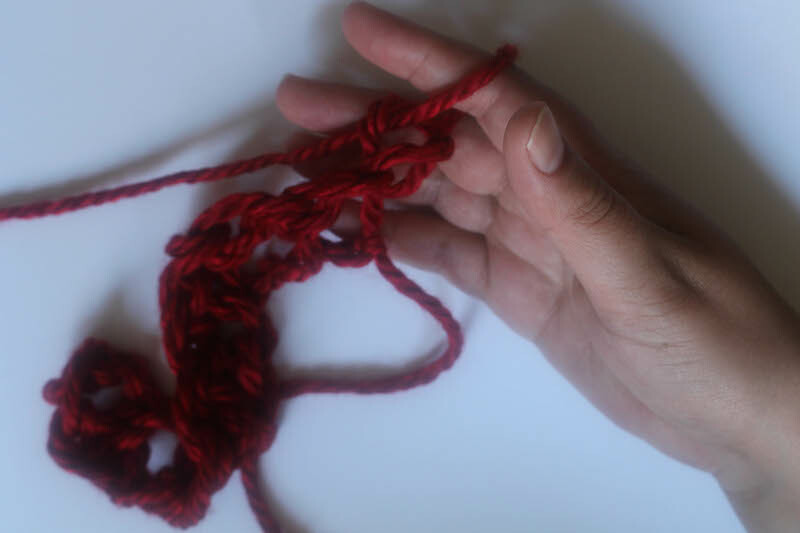 With your other hand, wrap the yarn over your forefinger from back to front. This step is like a yarn over (yo) in standard crochet. 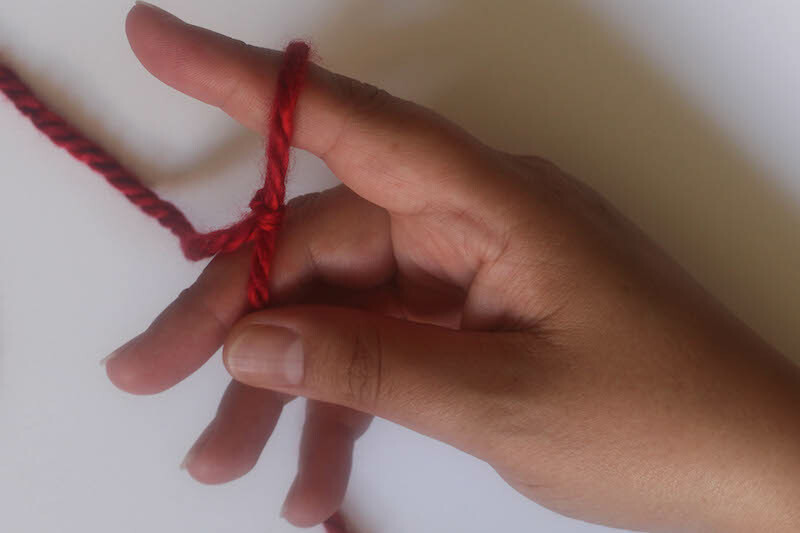 Bend your forefinger and draw the yarn through the loop already on your finger. 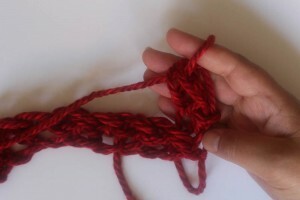 You may need to use your other hand to help pull the yarn through. Continue these steps until the foundation chain is as long as you’d like for your project. Skip the first chain. 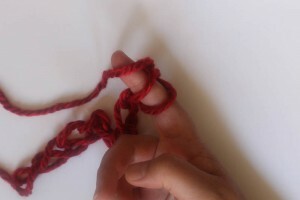 (The loop on your finger doesn’t count as a chain, so skip the first one that’s off your finger.) This step is like skipping the turning chain (t-ch) in standard crochet. Insert your forefinger into the next chain. With your other hand, wrap the yarn over your forefinger. 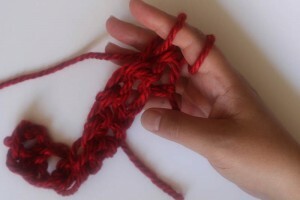 Draw the yarn through the first loop on your forefinger. You should still have two loops on your finger. 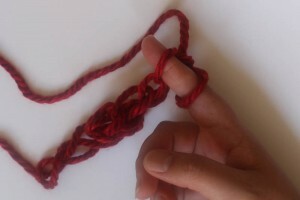 Pull the yarn through both loops on your finger. 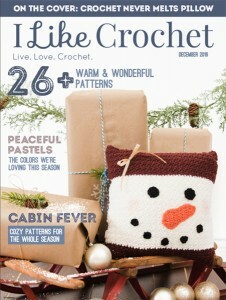 You’ve made a single crochet! Insert your forefinger into the next chain. 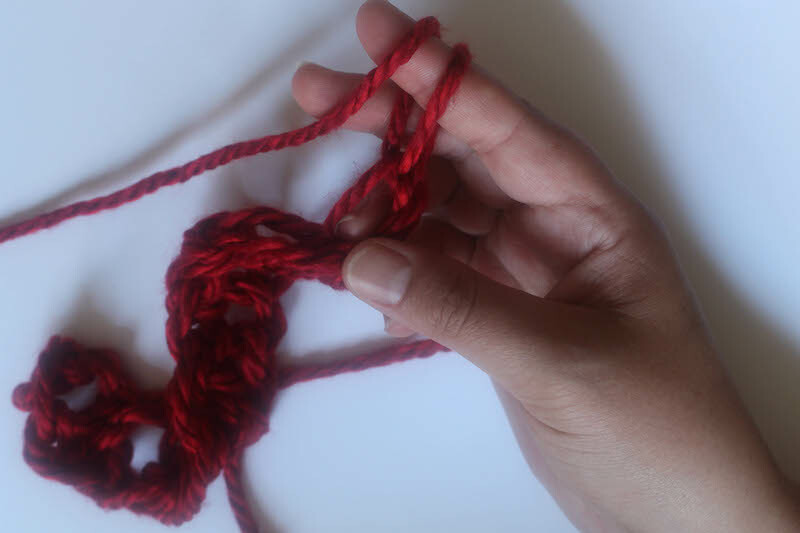 With your other hand, wrap the yarn over your forefinger. 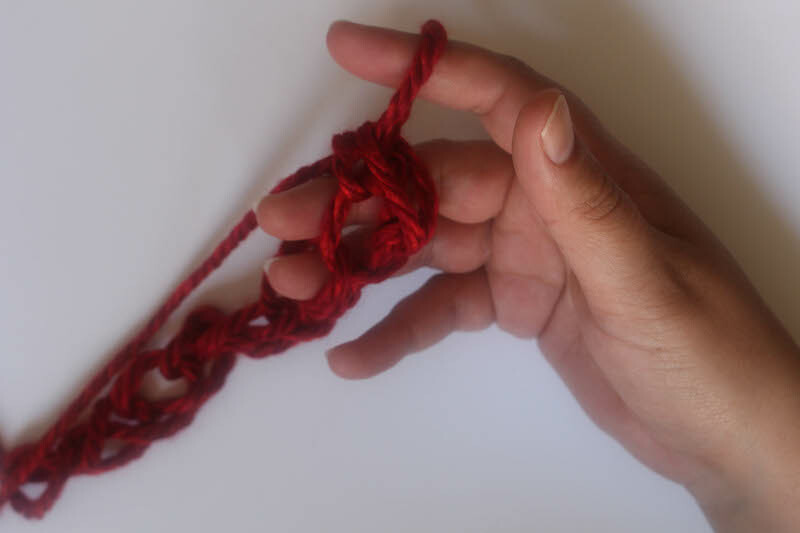 Draw the yarn through the first loop on your forefinger. You should still have two loops on your finger. 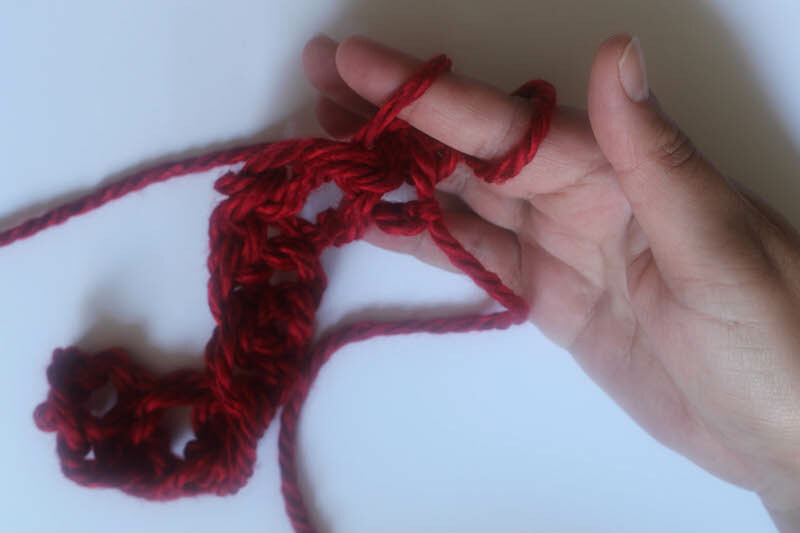 With your other hand, wrap the yarn over your forefinger. Pull the yarn through both loops on your finger. Repeat these steps across until you have a row of single crochet stitches. 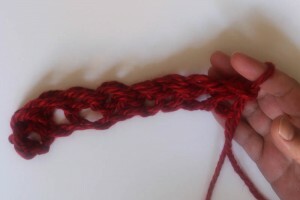 To make the next row of single crochet stitches, turn. 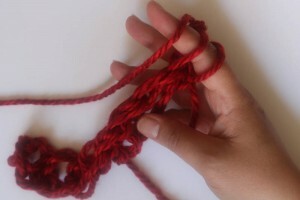 and draw the yarn through the loop on your forefinger. 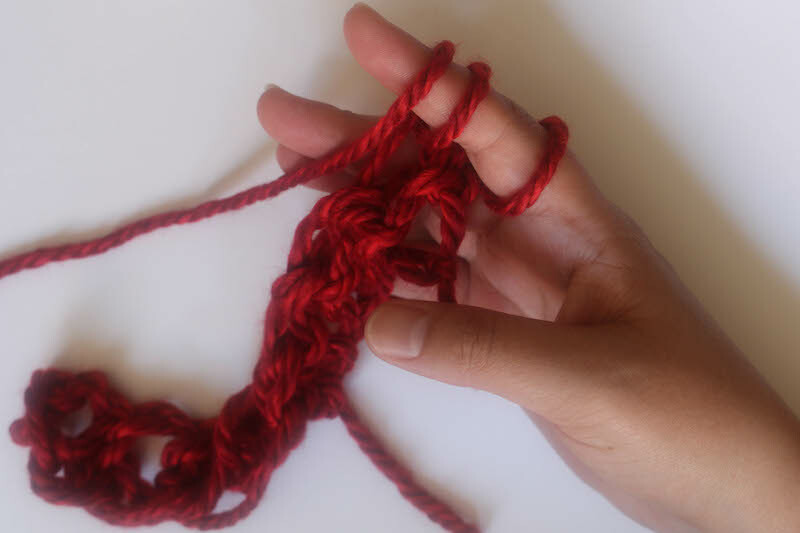 Repeat these steps for working a single crochet by inserting your forefinger in the next (first) stitch. 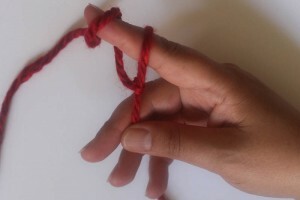 Pull the yarn through both loops on your finger. Repeat these steps until you have as many of single crochet stitches as you need for your project. When you’re ready to finish off your project, cut the yarn, leaving about 5” of yarn tail. 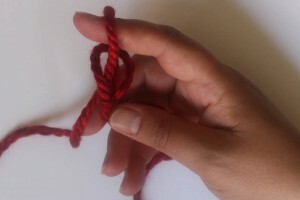 Draw that short end through the last loop on your finger to finish off. 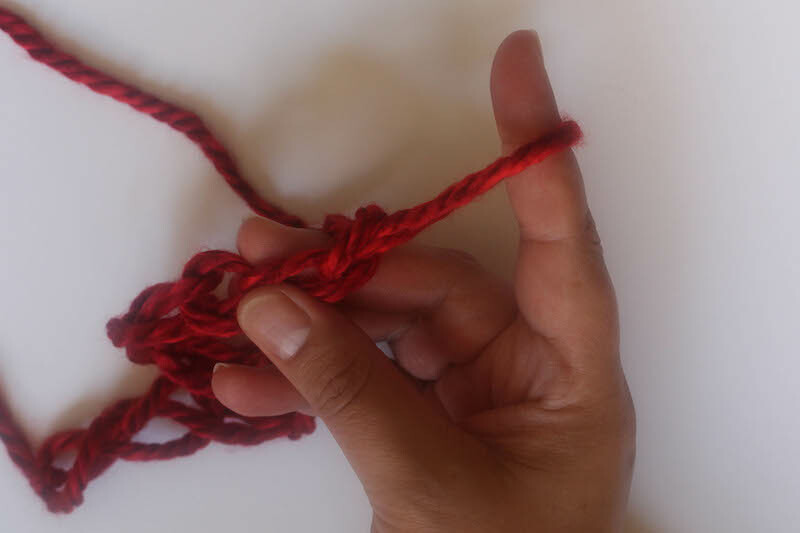 Use a yarn needle or crochet hook to weave in the yarn tails. 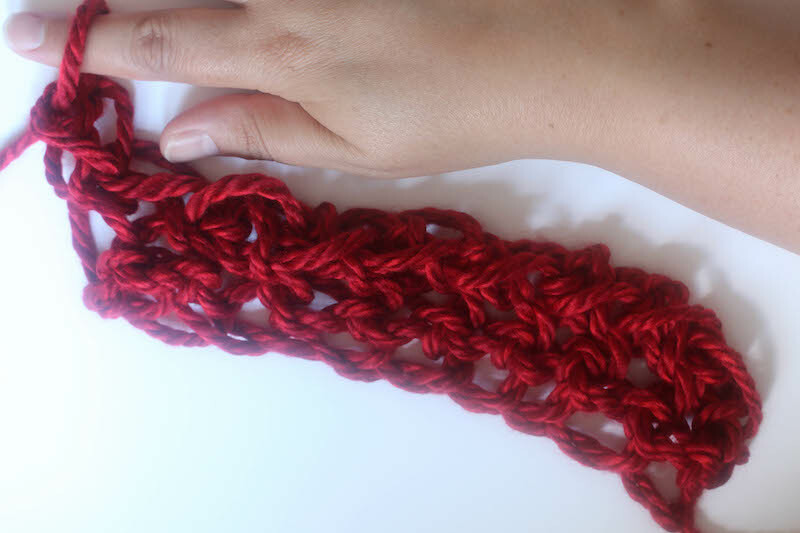 The possibilities are endless with finger crochet, but it makes great bulky scarves and shawls! THANK YOU!!!! now I know what I can do while I’m “waiting” here or there. sincerely, Linda G..